Literature on Black people | The World of C.C. My first encounter with novels on black people was at the time when I got an e-mail from Vintage Publisher, telling me that I wrote some wonderful book reviews and would love to reward me six books. 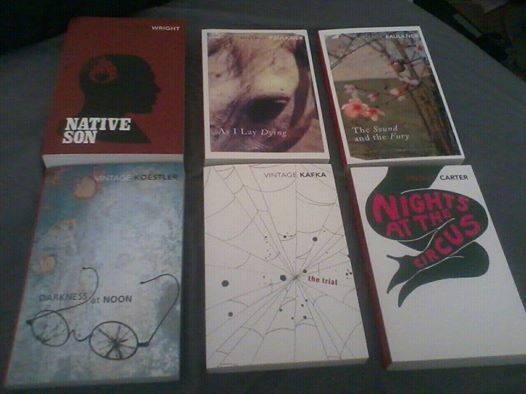 After days of consideration, I included “Native Son” into the list of books I requested – for free! “Native Son” was a very explosive book if you ask me, it was about a young man got a job to work in a white household. However under a fatal accident he killed a woman and since then have been stuck under many trouble, eventually he was to be in trial and many of the problems being questioned along with such incident. Throughout the novel, there was a sense of oppressed anger within – which reminded me of “stop and search” I learnt in sociology lessons, many people were more likely to be stopped and searched based on their race and appearance. Despite how racism was being taken seriously, problem remains. The second time I encountered literature on black people was through my partner and his habit of collecting second-hand books, novels; history or archaeological matters, “Go Tell It To the Mountain” was among his collections. I began reading it after finishing my dissertation – I was very much out of life when writing dissertation, reading was almost a painful job for me thanks to it. Out of randomness, I began to read the book while my man yet got round to it. The novel was interesting to be honest, I felt as if watching a family drama on television, where everyone seemed to have secrets behind their backs such as the main character’s secret hatred to his father. Currently reading Zora Neale Hurston’s “The eyes were watching God”, will talk about it later on when have time, hopefully once it finished, will be nice to start Alice Walker’s “The Colour Purple”…I have heard it was an amazing novel, we will have to wait and see.